Recently, when I went to Sugarloaf Mills, I saw that a new place had opened in the space formerly occupied by a defunct Mexican restaurant, Red Crawfish. I tried it back in early December, for the first time, and have returned several times since with some co-workers. Interestingly, it is the second Vietnamese-owned Cajun restaurant in the metro area to my knowledge (Crawfish Shack Seafood on Buford Highway is the other). I did ask if there was any common ownership between the two and they said no. The lady I spoke with said that her husband had come from Vietnam into Mobile in the late seventies, and they had relocated to Atlanta some years ago. 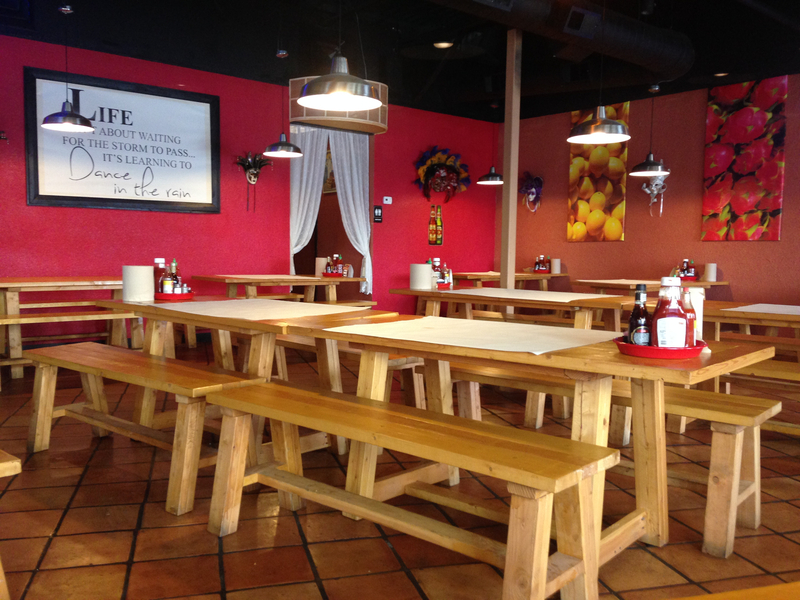 Inside, there are wooden picnic tables (handmade by the owner, according to the menu – you can see them in the top picture) and many of the wall decorations are leftovers from the Mexican restaurant days. 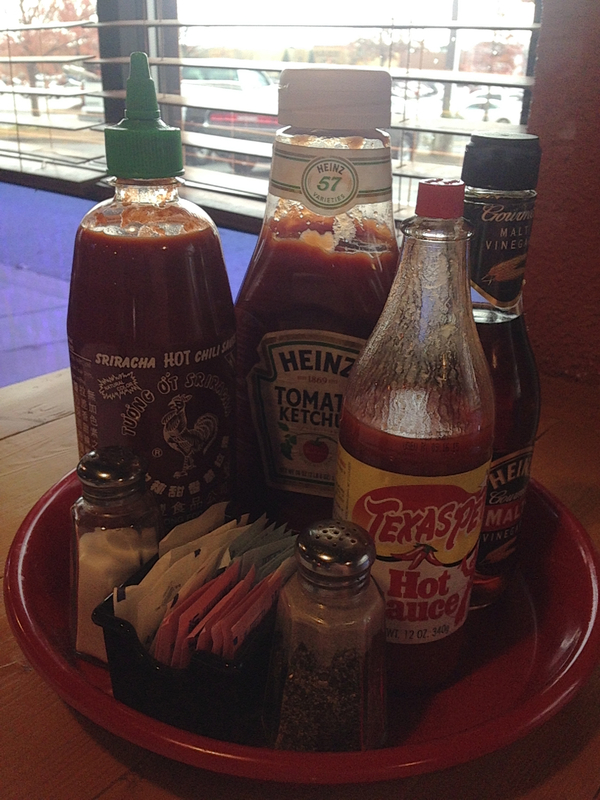 One of the most “unique” features, is the condiment tray with sriracha, hot sauce, ketchup and malt vinegar sharing equal real estate. Not a normal combination, unless you’re on the second shelf on the door of our fridge. On the first visit, I ordered the buffalo shrimp lunch, which is the same dish I have ordered on each occasion that I’ve been there. It is a good number of shrimp that are served with a remoulade sauce and fries that really make the meal for me. 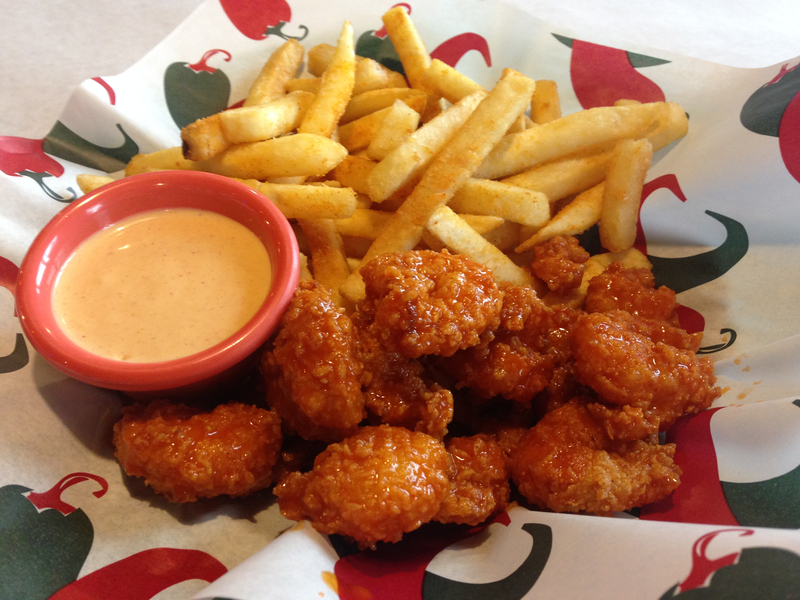 The fries are slightly sweet and always seem to be hot. The buffalo sauce is neither too vinegary nor too hot, and the meal, at $9.95, is fairly priced. But, I’ve been back several times since that first visit and there never seems to be a crowd. They may have a better evening business than lunch crowd, or it may be a location issue, as it’s not facing on the main road and faces into the mall parking lot on the loop road. I guess time will tell.